According to the owner everything works as it should. The boat covers does its job protecting the Monterey, but does show wear (couple tears). There is a spot in the back corner under the snap-in carpet that had a repair that was not repainted. Everything was professionally done (just cosmetic) Stock #161380 Great Monterey Bowrider in good condition looking for new owners for upcoming season. 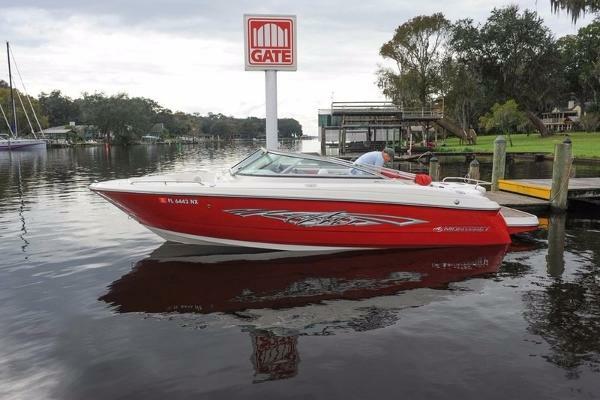 If you are in the market for a bowrider, look no further than this 2007 Monterey 234 FS, priced right at $23,000 (offers encouraged). 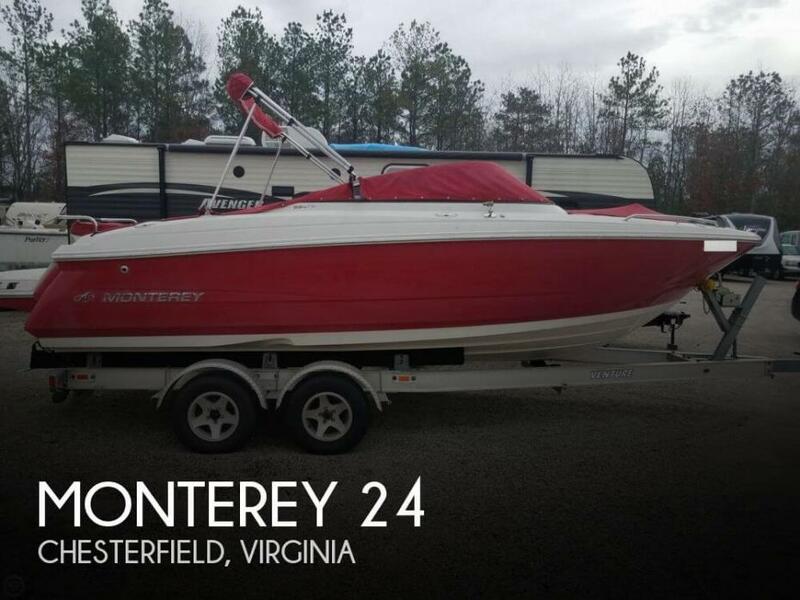 This boat is located in Chesterfield, Virginia and is in good condition. She is also equipped with a Mercruiser engine that has only 230 hours. 2007 Monterey 234FS You are looking at a 2007 Monterey 234. This is a very nice bowrider and has been professionally maintained. This Monterey has a new motor that was installed last year and probably has about 50 hours on the new motor. This boat comes with a Bimini top, Cover, Head, Stereo, Depthfinder, and newer upholstery. This is a nice boat and it is priced to sell. It does not have a trailer however new ones are available. 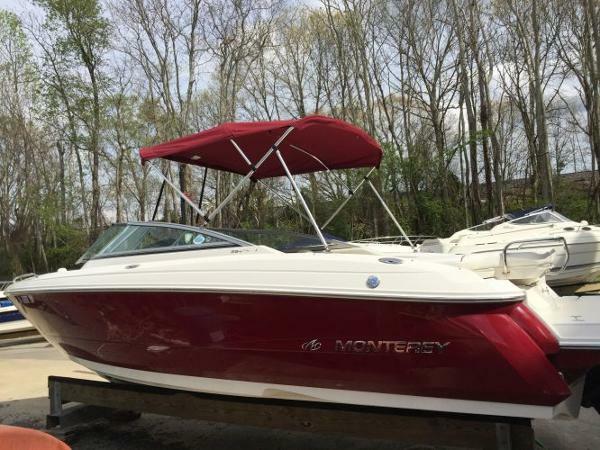 2006 Monterey 234FS Very Good Condition 2006 Monterey 234 FS with Volvo Penta 5.0 GXiDP engine and custom tandem trailer with brakes. Boathas been well maintained and includes cockpit & bow covers, snap in carpets, bimini top, and more. Boat is currently in indoor staorage and can be seen by appointment. Ideal for wakeboarding, skiing, and towing, the FS packs up to an optional 320 hp engine and has a spacious aft sun deck. Loaded with amenities such as roomy seating, ample storage for all your water toys and a large swim platform ensure your outing on the water will be an enjoyable one. 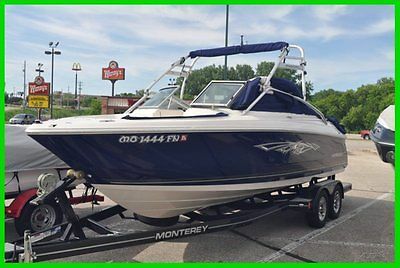 2010 Monterey 234 FS 2010 Monterey 234 FS 24'0" (7.32 m) BEAM 8'6" (2.5 m) FUEL CAPACITY 62 gal (234.7 ltr) MAXIMUM HORSEPOWER 270 SEE FULL SPECS Spec US Unit Metric Unit Description Beam 8' 6" 2.5 m Width of hull at widest section including rubrail Bridge Clearanance W/Tower 8'1" 2.47 m Height from water to highest point on tower, normal load Deadrise 20 degrees 20 degrees Angle of keel measured at transom Draft - Stern Drive Down 38" 96.5 cm Depth of hull to bottom of stern drive, trimmed down Draft - Stern Drive Up 22" 55.9 cm Depth of hull to lowest point, stern drive trimmed up Dry Weight 4,300 lbs 1950.5 kg Mass of boat with engine(s) and batteries, no fuel, water, waste, or gear Fuel Capacity 62 gal 234.7 ltr LOA W/Swim Platform 24' 0" 7.32 m Max Persons W/ Gear Weight 2,000 lbs Max Persons Weight (1,800 lbs) 816.5 kg Max Power 320 hp 238.6 kw Water Capacity 10 gal 37.8 ltr Features Standards and Options Covers Bimini Top w/Embroidered Boot Standard Bow and Cockpit Cover Optional Convenience Cooler, 25 Qt Carry-On Standard Drink Holders, Stainless Steel (10) Standard Fiberglass Cockpit Liner w/Non-Skid & Drainage Standard Glove Box, Port Side, Lockable Standard Grab Handles, Black Urethane w/Stainless Steel Inserts Standard Hatch, Engine Compartment, Gas Assisted Outlet, 12 V Standard Stereo, Kenwood Satellite Ready AM/FM (4) Speakers Standard Storage, In-Floor Standard Storage, Side Panels Standard Storage, Starboard Helm w/Hanging Rod, Trash Receptacle, Dock Line Straps (2) & Dry Deck 2010 Monterey 234 FS Bowrider for sale located in Jacksonville, Florida shows in excellent condition. This low hour Monterey bowrider is powered by a single Volvo penta 5.0 GXi. This is the boat you’ve been waiting for. Become one of the elite captains of the 234FS Sport Boat and immerse yourself in features such as Backlit Faria gauges with stainless steel bezels, Garmin GPS, and KENWOOD sound system at the helm. Seating features include captain and passenger swivel seats with folding bolsters, large sun deck, L shaped rear seating, lounging seats at the bow and ample storage underneath most seat for all your gear, all of which help guarantee your outings on the water will be more than enjoyable. 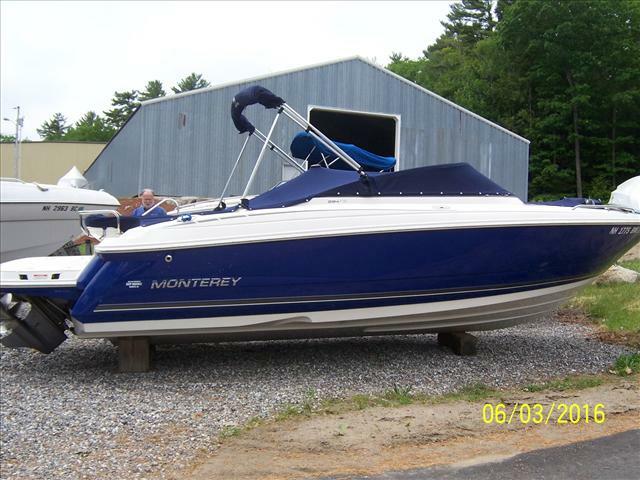 2007 Monterey 234 FS, Fresh water, 1 owner boat with 358 hours. Powered wit ha Volvo Penta 5.0 GXi, Duo Prop. Pump-out head, snap-out carpet, bow & cockpit cover, bimini top, stereo, battery switch, walk-thru transom, ext swim platform. 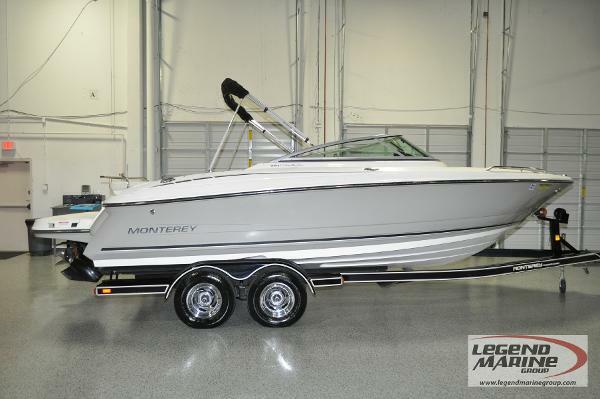 2008 Monterey 234FS 2008 Monterrey 234 FS, Mercury 350Mag Bravo 1 Drive, 48 Fresh Water Hours, Docking Lights, Cockpit Carpet, Bimini Top, Front and Rear Covers, Depth Finder, Transom Remote, Porta Pottie and more, Very Very Clean Boat 1 owner Don't Miss Out. Matching Dorsey Trailer. All Trades Accepted, Financing & World Wide delivery available. Legend Marine Group STOCKS a Broad selection of Boats from Fountain, Donzi, Formula, Baja, Daves Custom Boats, Eliminator, MTI, Skater, Outerlimits, Cigarette Racing and MORE. Our inventory also includes over 50 used and brokerage hi-performance boats from all manufacturers. Our 30,000 sq foot sales, parts and service facility is located in Carrollton, TX 2 miles North of Dallas, TX & only 10 min from (DFW), (DAL) Air Port or Addison Air Field (ADS) for Private Air Transportation. We are a full line Mercury hi-performance dealer and offer an extensive parts inventory as well as complete service on motors ranging from 185hp to over 1400hp. 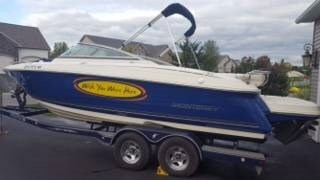 Our Professional & Experienced sales and service staff will fulfill all your boating needs today!! 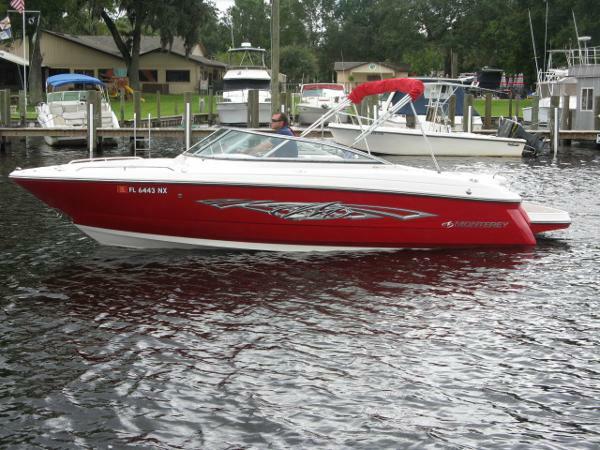 2008 Monterey 234 FS 2008 Monterey 234FS BowriderWe have a nice 2008 Monterey 234 FS for sale with 218 hours on it. It has a Volvo-Penta 5.0 GXi with 270 hp. This boat has a wakeboard tower with Bimini top and tower speakers, over-sized swim platform, Non-Skid cockpit area instead of carpet. This boat also has a porta-potty with pump-out, front and rear boarding ladders, pop-up cleats, and many more features that make this a lot of boat for the money. Boat comes with pictured galvanized trailer. Garret Mclaughlin (507) 280-4696 5327 East Frontage Rd NW Rochester Minnesota 55901 ? ? ? ? 07 MONTEREY 234 FS Vehicle Information Year: 2007 Make: MONTEREY Model: 234 FS Condition: Used ? ? ? ? 1 of 19 ? View Large Images ? ? 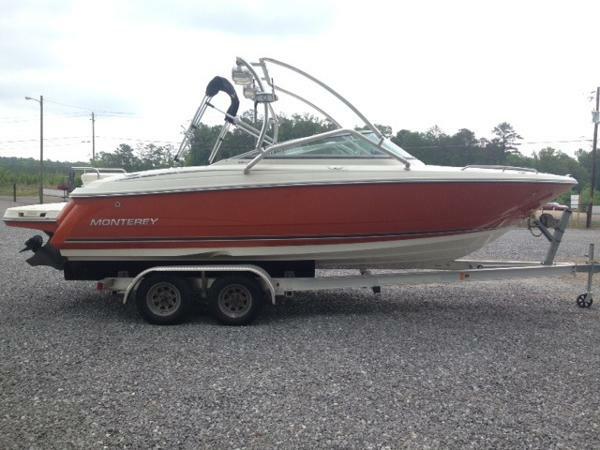 ?Credit Application ?Directions to Dealer ?Contact Us Options and Standard Features Basic Information Type: Bowrider Use: Not Specified Condition: Used VIN: RGFME330H607 Stock Number: MB-30H607 Model: 234 FS Make: MONTEREY Year: 2007 Length / Beam Length (Feet): 0 ? Apply Now Secure Credit Application Applying for a vehicle loan online is one of the quickest and easiest application methods. Our secure application is easy to complete, all you need are a few personal and employment details. Contact River Valley Power and Sport - Rochester, MN 5327 East Frontage Rd NW Rochester Minnesota 55901 View Map Ask for:Garret Mclaughlin Primary Phone:(507) 280-4696 Contact: ?Contact Us Terms Placing a Bid: Your bid constitutes a legally binding contract to purchase this vehicle. Please do not bid if you're not seriously interested or financially able to purchase this vehicle. Please read eBay's User AgreementRiver Valley Power and Sport - Rochester, MN reserves the right to, Obtain and verify the registered information of all users who bid on this auction. Cancel any and all bids at our discretion, or end the auction early if necessary.Bidders Age: You must be 18 years of age or older to Bid. Special eBay Bid Retraction Rules: Please read eBay's "Retracting a Bid" If you place a bid before the last 12-hour period of the auction: You may retract that bid before that last 12-hour period but only for exceptional circumstances. You will not be allowed to retract that bid during the last 12-hour period of the auction. If you place a bid during the last 12-hour period of the auction: You will be allowed to retract the bid for exceptional circumstances but only if you do so within one hour after placing the bid.Funds & Financing: For help in arranging for a Pre-Approved loan or for any questions please e-mail or phone Garret at(507) 280-4696 prior to bidding. Buyers Inspection: River Valley Power and Sport - Rochester, MN has done our best to disclose all information known about this vehicle for auction. River Valley Power and Sport - Rochester, MN welcomes a buyers inspection. If you plan to have a buyers inspection, please make sure you inspect the vehicle prior to the auction ending. Inspection fees if any are Buyers responsibility. Representations and Warranties made by seller: This vehicle is being sold "as is". Manufacturer's warranties may still apply. Extended warranty may be available, e-mail or phone Garret at (507) 280-4696 for details. No representations or warranties are made by seller, nor are any representations or warranties relied upon by bidders in making bids. Taxes and Registration fees: Out of state buyers are responsible for all state, county, city taxes and fees, as well as title service fees in the state that the vehicle will be registered. All taxes and fees must be paid in full in order for vehicle to be titled and registered. Title Information: Vehicles titles may be held by banks or lenders as collateral for loans. In many cases there is a delay in receiving the original instruments up to 21 days from the time we pay a vehicle off. While we usually have all titles in our possession at closing, there are occasions where we may be waiting for them to arrive. If payment is made by cashier's or personal checks we will hold all titles for 10 days or until funds have cleared. Shipping & Delivery: All shipping charges are buyer's responsibility. River Valley Power and Sport - Rochester, MN will help with shipping arrangements but will not be responsible in any way for claims arising from shipping damage!Licensed Carriers are generally insured for $3,000,000.00. We assume no responsibility for damages incurred after the vehicle leaves our showroom. All shipping arrangements are provided by River Valley Power and Sport - Rochester, MN as a courtesy. We are not affiliated with any carrier. Any claims or other communication regarding shipment of vehicles will be between you and the shipper, not with River Valley Power and Sport - Rochester, MN. The amount of time it takes for delivery is dependent on the carrier, but is generally 7-14 days from the date the vehicle is picked up from our facility until it is delivered to your destination. Verify with the shipper for an Estimate Time of Arrival to be sure. Finalizing your Purchase: River Valley Power and Sport - Rochester, MN will contact the successful high bidder by e-mail after the auction closes. Successful high bidder MUST communicate with Garret at River Valley Power and Sport - Rochester, MN by e-mail or phone(507) 280-4696 within 24 hours of the auction ending to make arrangements to complete their transaction. If we cannot confirm your intention to buy or the sale is not completed within 5 days, we reserve the right to relist this vehicle or sell to any other qualified buyer. In order to secure bid on vehicle, Successful bidder (BUYER) must within 24 hours of bid closing send to Seller a Deposit in the amount of 10% by major credit card, cash in person or bank certified funds. Within 72 hours of bid closing, Buyer must send balance of funds by bank wire transfer, cash in person, bank certified funds to Seller. At time of sending initial deposit, Buyer MUST fax copy of their State issued valid Driver License. Furthermore, before said vehicle is released for shipment to Buyer, all other Sale related and title related paperwork must be signed and returned complete to Seller. Copyright © 2015 Auction123 - All rights reserved. - Disclaimer +- Auction123 (a service and listing/software company) and the Seller has done his/her best to disclose the equipment/condition of this vehicle/purchase. However, Auction123 disclaims any warranty as to the accuracy or to the working condition of the vehicle/equipment listed. The purchaser or prospective purchaser should verify with the Seller the accuracy of all the information listed within this ad. Selling a Vehicle? Create Professional Listings Fast and Easy. Click Here!